Worldwide, many regions have a great potential to cover part of their pressing water needs by renewable energy powered water treatment processes using either thermal or membrane based technologies. Not only arid and semiarid regions are increasingly suffering from water shortage but also many other regions face a limitation of freshwater resources either by increasing contamination of surface water bodies or groundwater resources unsuitable for drinking and irrigation purposes either due to their high grade of mineralization or their contents of toxic components. In many areas without centralized water supply, treatment techniques using locally available renewable energy resources such as wind, solar and geothermal can provide an economical, social and environmentally sustainable option for clean water production from seawater and from highly mineralized or otherwise unsuitable ground- and surface water. This book provides an overview on possible cost-efficient techniques and application opportunities for different scales and shows why the implementation of these technologies faces numerous technological, economic and policy barriers and provides suggestions how they can be overcome. 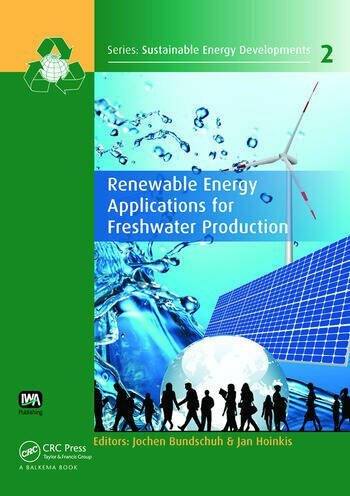 It serves as a synoptic compendium of the fundamentals of freshwater production using renewable energies, applicable to all types of water, ranging from brackish to marine water and also including industrial and communal residual water. The book is aimed at professionals, academics and decision makers worldwide, working in the areas of water resources, water supply,land planning, energy planning, greenhouse gases emission mitigation and rural development. Jochen Bundschuh (Germany, 1960), finished his PhD on numerical modeling of heat transport in aquifers in Tübingen in 1990. He is working in geothermics, subsurface and surface hydrology and integrated water resources management, and connected disciplines. From 1993 to 1999 he served as an expert for the German Agency of Technical Cooperation (GTZ) and as a long-term professor for the DAAD (German Academic Exchange Service) in Argentine. From 2001 to 2008 he worked within the framework of the German governmental cooperation (Integrated Expert Program of CIM; GTZ/BA) as adviser in mission to Costa Rica at the Instituto Costarricense de Electricidad (ICE). Here, he assisted the country in evaluation and development of its huge low-enthalpy geothermal resources for power generation. Since 2005, he is an affiliate professor of the Royal Institute of Technology, Stockholm, Sweden. In 2006, he was elected Vice-President of the International Society of Groundwater for Sustainable Development ISGSD. From 2009 - 2011 he was visiting professor at the Department of Earth Sciences at the National Cheng Kung University, Tainan, Taiwan. By the end of 2011 he was appointed as professor in hydrogeology at the University of Southern Queensland, Toowoomba, Australia where he leads where he leads a working group of 26 researchers working on the wide field of water resources and low/middle enthalpy geothermal resources, water and wastewater treatment and sustainable and renewable energy resources (http://www.ncea.org.au/groundwater). In November 2012, Prof. Bundschuh was appointed as president of the newly established Australian Chapter of the International Medical Geology Association (IMGA). Dr. Bundschuh is author of the books “Low-Enthalpy Geothermal Resources for Power Generation" (2008) (CRC Press/Balkema – Taylor & Francis Group) and “Introduction to the Numerical Modeling of Groundwater and Geothermal Systems: Fundamentals of Mass, Energy and Solute Transport in Poroelastic Rocks”. He is editor of the books “Geothermal Energy Resources for Developing Countries” (2002), “Natural Arsenic in Groundwater” (2005), and the two-volume monograph “Central America: Geology, Resources and Hazards” (2007), “Groundwater for Sustainable Development” (2008), “Natural Arsenic in Groundwater of Latin America (2008). Dr. Bundschuh is editor of the book series “Multiphysics Modeling”, “Arsenic in the Environment”, and “Sustainable Energy Developments” (all CRC Press/Balkema – Taylor & Francis Group). Jan Hoinkis (Germany 1957), holds a degree in chemistry and a doctorate in the field of thermodynamics from Technical University Karlsruhe. He has about 7 years work experience in chemical industry being head of a group for process development. Since 1996 he is professor at Karlsruhe University of Applied Sciences where he is teaching and conducting research in the field of process engineering in combination with sensor/control systems. He is specialised in the areas of water treatment and water recycling by use of membrane technologies. He has co-ordinated a variety of national and international R&D projects in co-operation with research institutes and companies among them EU funded projects (AsiaProEco, LIFE, FP7). Since 2008 he is scientific director of the Institute of Applied Research at the Karlsruhe University of Applied Sciences. He is author of several peer-reviewed scientific publications and contributions to international conferences.